Here are all 26 letters of the alphabet in Sign Language. The letter 'J' and 'Z' have multiple poses, since these two letters envolve hand movement. zawarkal (5 years ago) Inappropriate? I awoke inspired to a project this morning and here is exactly what I needed, created 6 years ago. ஜ۩۞LadyNexion۞۩ஜ (8 years ago) Inappropriate? OrishaShango (10 years ago) Inappropriate? Being hard of hearing and knowing sign language also I have to say these are by far the best I have seen. To really use these more realistically I would suggest you either rent a video or go to Harris Communication website and get a sign language instructional video. jamminwolfie (11 years ago) Inappropriate? You know what's funny? I was going to create some alphabet signs for my music group so it'll help when someone doesn't know what key (music terms) we're playing in. 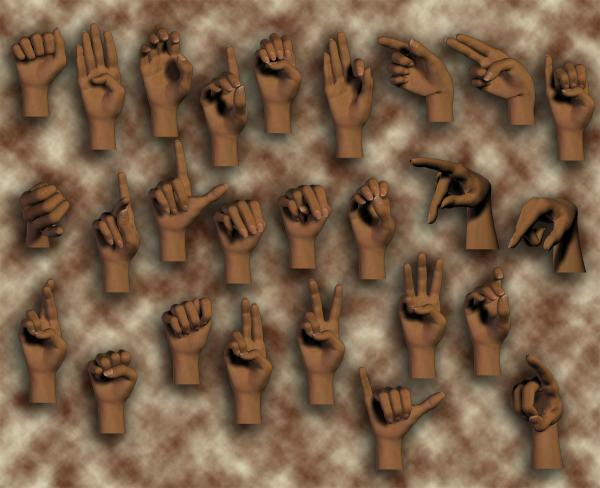 Being hard of hearing and knowing sign language, it was a great idea that I'd create some of them and print them out. Then I ran into this, great timing!! And thanks bunches!